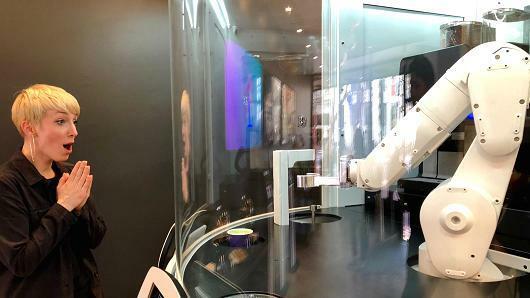 A San Francisco company has created a $25,000 robot barista that can crank out 120 allegedly good cups of coffee per hour, threatening human coffee shop employees far and wide. The machine was designed by the award-winning team behind Dr. Dre's Beats products, the Ammunition Group. Cafe X is effectively a fully functional café with a six-axis animatronic arm as its centerpiece. Customers order coffee via a touchscreen at the kiosk, or the Cafe X app - where a text message is sent when one's drink is ready. "We knew a robot could create an exceptional cup of coffee, but we also wanted it to appear warm and friendly," said inventor Henry Hu, 24, dreamed up the one-armed Barista while a sophomore at Babson College. Hu was stuck in a coffee line for too long at an airport, and thought "The baristas to me looked like factory workers... They were moving cups around and pushing buttons, which made me think, 'I bet we can build a product that automates these boring tasks way more efficiently." Armed with a $100,000 Theil fellowship to follow through on the idea, Hu and two friends hand built the prototype Cafe X by hand in a San Mateo, CA garage. That led to a $5 million seed capital injection from investors such as Social Capital, Khosla Ventures, Launch and Felicis Ventures - while more investment capital has trickled in since. For design work, Hu hired the design firm that worked on Square's point-of-service device and Lyft's distinctive glowing dashboard mustache. To date, total funding stands at $7 million after the Thiel Foundation and early Uber investor Jason Calacanis stepped in. 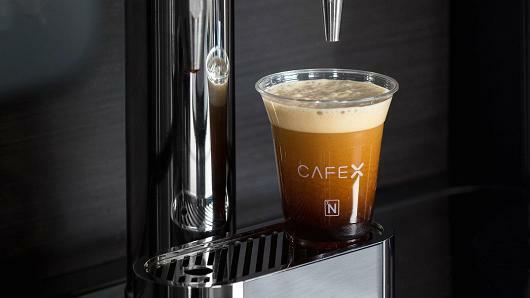 Cafe X's first model was installed last year at an AMC theater in San Francisco, while their second-generation arm was installed in the heart of San Francisco's financial district. All that's required is for a human to fill it with beans and milk, along with a good cleanout at least once a day. Product specialists are on site to help people adapt to their new robot barista whose only purpose in life is to crank out coffee all day. The bot typically fulfills between 300 and 400 orders a day. Prices are kept low, since there's little overhead. A basic cup of Americano coffee is $3, and there's no need to tip. Progressive bastion Starbucks, which is always fast when it comes to raising wages (and even faster when slashing paid hours worked) will not be adopting robot baristas to replace humans at its over 20,000 locations anytime soon, the company claims'; the company does however have a mobile app which allows customers to order beverages to be picked up later. Of course, the robots will come the second SBUX shareholders see them in action elsewhere and start wondering why profit margins aren't higher. Cafe X plans to scale its manufacturing capabilities this year, and will be launching more locations next year as part of a growing trend towards automation we have covered extensively.